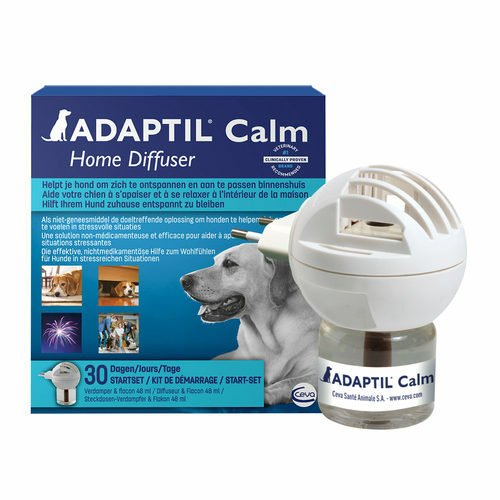 The Adaptil Calm Diffuser is a safe and effective product for dogs, that can be used for the prevention and treatment of anxiety and stress. Dogs that suffer from anxiety and stress may exhibit unwanted anxiety and stress-related behaviour. This behaviour can occur due to fear of loud noises (such as thunderstorms or fireworks), a new environment (e.g. moving to a new house), separation anxiety or the presence of a new family member. Puppies and adult dogs may display undesirable behaviour in these situations, such as excessive barking or licking and fouling or destructive behaviour. If these situations sound familiar to you, the Adaptil diffuser may be able to help your dog! All lactating females release (appeasing pheromones), which ensure that the offspring feel calm and reassured. Research has shown that the calming effect of these pheromones can still occur at an older age. All Adaptil products (apart from the tablets) contain a formula which replicates the natural soothing dog pheromones. Puppies, to get used to their new home. To calm several dogs in the house at the same time. To reassure your dog before and during fireworks. You should plug the Adaptil diffuser into a socket in the area where the dog usually spends the most time. One refill is sufficient for a 30-day treatment, in a space of approximately 50-70 m². Adaptil is remarkably effective. According to the manufacturer, after one month of use, 72-85% of dogs stop barking and destroying property when they are left alone. The positive effects occur quickly, usually in the first week of treatment. For best results, it is recommended to use the Adaptil diffuser for at least 1 month, alongside obedience training. The manufacturer recommends that you replace the diffuser after using five refills. Please note: This item has a 2-pin plug, but comes with a UK 3-pin adaptor. In addition to the diffuser, the Adaptil range consists of Adaptil spray, the Adaptil collar and Adaptil tablets. Below you can see which product is best for various situations. Have you used Adaptil Calm Diffuser & Refill before? Let us know what you think about this product. Last year in December we had the Adaptil diffuser in use. Found our dog noticeably calmer during the various explosions, which have been going on throughout the month. On New Year's Eve I added a few adaptil tablets. Our 8 year old Border Collie with serious separation anxiety urinated in the house when we were upstairs or out. Since we have Adaptil diffuser, the peeing in the house is over. We have been using this for some time and continued use following our dogs enforced rest following cruciate surgery. The Vetsend price was very competitive and I ordered the refill alongside another product. Very pleased with item, shopping experience in general and will happily use Vetsend again.